ps General Comments Off on Who Gets Gout? There is a popular belief that only middle-aged, overweight men who eat and drink too much suffer gout. This is a myth – gout can attack young men in their twenties and also women, although it is very unusual in women and occurs mainly after the menopause. An attack of gout is caused by uric acid suddenly forming crystals inside a joint, causing intense inflammation with pain, redness and swelling. Uric acid is produced when purines, which are chemicals present within all living cells, are broken down. Purines are produced by the body itself and are also found in many foods. People prone to gout have an inherited tendency to produce a lot of uric acid. High levels accumulate in the bloodstream and are deposited in the body’s tissues. Common sites are the joints, the kidneys and the skin over the tops of the ears, hands and elbows. If the kidneys are affected, then they do not work as well as they should at excreting the uric acid in the urine and the levels become even higher. Uric acid deposits under the skin appear as whitish lumps, called ‘tophi’. They may ulcerate and discharge material that looks like toothpaste. It is not always clear what causes the uric acid suddenly to form crystals in the joints and set off inflammation, but a common trigger is minor injury to the joint. A typical attack of gout is easily recognisable. At first, there is only minor discomfort but, within a matter of hours, the joint is swollen, hot, red and extremely painful. The pain is so severe that wearing shoes is out of the question, and you may not even be able to bear the touch of a bedsheet. Even with no treatment, the attack subsides completely within a few days, and always within a week. Attacks may recur, although sometimes not until months or years later. In 70% of people, the knuckle joint of the big toe is the first joint, and often the only joint, to be affected, although symptoms can develop in any joint. Often your doctor will be able to recognise that you have gout from your symptoms and the appearance of the affected joint. You will need to have blood tests to measure the amount of uric acid in your bloodstream and to check whether your kidneys have been affected. A sample of fluid may sometimes be taken from an acutely inflamed joint with a fine needle and syringe. Non-steroidal anti-inflammatory drugs are very effective and can shorten an attack if they are taken right at the beginning. Before these drugs became available, the traditional treatment for an attack of gout was a drug called colchicine, derived from the autumn crocus. Colchicine is still used and it is also very effective, although it can cause troublesome diarrhoea in some people. In fact, both anti-inflammatory drugs and colchicine are so effective if taken early that people who have frequent attacks of gout are well advised to keep a supply in the medicine cabinet, so that they can take it at the first sign of trouble. An attack of gout is caused by uric acid suddenly forming crystals within a joint, causing intense inflammation with pain, redness and swelling. If you still get frequent attacks, say more than three times a year, despite these measures, your doctor may suggest that you take drugs to lower the level of uric acid in your body. The main one is allopurinol which, taken daily as tablets, blocks the chemical pathway leading to uric acid production. The uric acid deposits in the body tissues are then slowly removed into the urine and so leave the body. Drink plenty of clear dilute fluids (water or codial), at least three litres a day, especially in hot weather and when you’re on holiday, because an attack is more likely if you become dehydrated. Keep your alcohol consumption within recommended levels – 21 units a week for a man and 14 for a woman. A unit is half a pint of beer, a small glass of wine or a single measure of spirits. Cut down on food and drink containing high levels of purines; these include high-protein foods such as red mean and pulses, offal (liver and kidneys), sardines and anchovies. Avoid Nuts, Beans and Lentils. It is better to eat meals based around complex carbohydrates, such as pasta. Avoid taking aspirin, which stops the kidneys from excreting uric acid; take paracetamol instead for minor aches and pains. 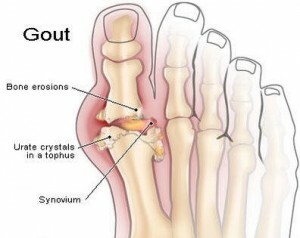 Gout attacks are very painful, seek medical help early. Call +65 6471 2674 (24 Hour) to make an appointment to see our doctor to treat your Gout Attack today. Diagnosis of gout involves inserting a needle into the affected joint and drawing a sample of the fluid that lubricates the joint (called synovial fluid). The fluid is then analyzed under a microscope to determine if uric acid crystals are present and if a blood test (uric acid) is required. There are a number of steps you can take to reduce the pain and swelling of a gout attack. Left untreated, attacks of gout may become more frequent and last for longer. Raise and rest your joint. You shouldn’t do any vigorous physical activity. Sometimes your doctor may give you a splint to wear to stop you moving your joint. Keep your joint cool and don’t cover it. Apply ice wrapped in a towel to your joint for about 20 minutes to help reduce swelling. You shouldn’t apply ice directly to your skin as it can damage your skin. If you need to repeat this, let your joint return to its normal temperature first. There are some medicines your doctor can prescribe to help ease the pain and swelling of an attack of gout. Non-steroidal anti-inflammatory drugs (NSAIDs), may relieve pain and inflammation. If you have a heart condition, high blood pressure, kidney disease, lung disease or if you’re over 65, these medicines may be harmful so you should talk to your doctor about taking them. Alternatively, your doctor may recommend a steroid injection if you have gout in a large joint (such as your knee). If you have repeat attacks of gout, there are medicines you can take to help to prevent it.